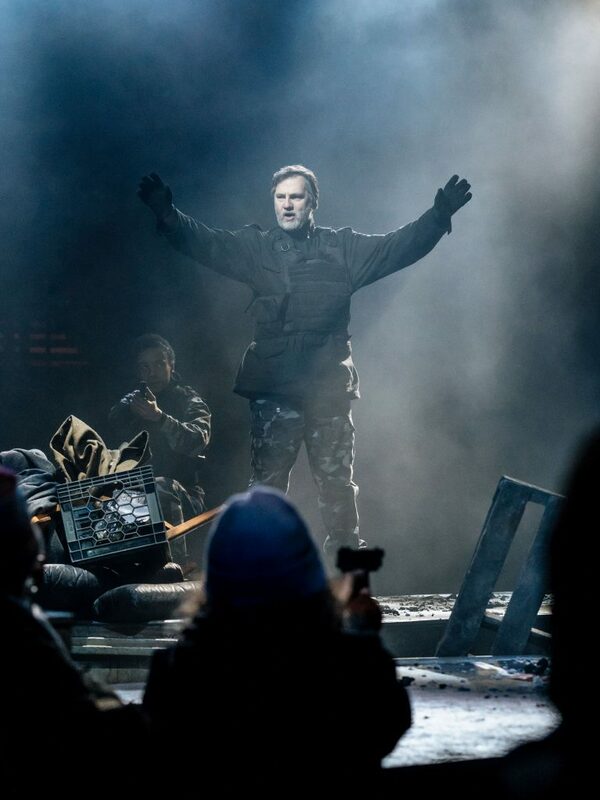 Coming on the back of the critically acclaimed Young Marx, The Bridge Theatre has another stunning production on its hands in the shape of Julius Caesar by Nicholas Hytner. The Bridge Theatre is juxtaposed to its Victorian adversary, Tower Bridge in situation, with its recently revamped exterior, making it almost blend in with the freshly modernised bank. However be warned, mind your footing! The newly paved area outside is a victim of its own sleek success, as ice frequently forms in the vicinity of the purpose built stream at this time of the year. Once inside the venue you’re engulfed by a warm and vibrant atmosphere, as well as being blessed by a wide selection of wine and nibbles; anchovy twists, crispy pig-skin or radishes and butter provided by the iconic London restaurant St John, and the St John bakery. Don’t worry though; larger items are available such as potted beef, to satisfy the more “healthy” appetite while you await your evening’s entertainment. When the bell announces the start of the play you are invited into either the upper seating region or onto the lower concourse to the “pit”, specially created for this production. From my experience the bell tolls somewhat prematurely and sounds like the Hawaiian Missile Alert System false alarm, so don’t rush to finish that glass of wine or choke on that last crispy pig skin. In addition there is a distinct lack of signage, leaving you to look around wildly for where your supposed to go, or more accurately forcing you to be swept along at the mercy of the tide of people moving to their entrance while you ponder how they know where to go and hoping, and, praying that they take you to the right place. The staff however are absent for a reason. Having left the National Theatre where he brought renewed life and vigour, Nicholas Hytner has allowed himself free rein to imbue his productions with more overt political overtones to draw attention to the swirling extreme political times we find ourselves in. Shakespeare’s Julius Caesar lends itself to this treatment particularly well. He has produced an analogue of Rome, updated to fit a modern society, and convey his thoughts on the risks associated with a hyper-connected society and how vulnerable it is to the use of propaganda and “fake news”. This runs along side the other great theme of the play, political assassination and the pros and cons of eliminating tyrannous leaders and the series of unfortunate events that can occur after. The atmosphere in the auditorium as you enter is misty and mysterious, with a small band performing on the stage, red hats with “Julius” inscribed on them being sold on trolleys laden with beer, by the absent staff, who double as backing and support dancers. A distinctly Trump style “American First” vibe is omnipresent; however this itself is also pierced by the subtle notes of anarchy. I, along with my brother, opted for the “pit” tickets as they are advertised as being fully immersive. Imagine being in the mosh pit at a Prodigy gig as opposed to standing. To an extent this is perhaps the most apt analogy. It is not clear precisely as to the exact point the play begins. It seems more like a natural evolution of events with everyone being an active participant in the action, in an environment that at points is akin to the London Riots in 2011. Ben Wishart heads the four main leads as he delivers an entrancing portrayal of Brutus. His dishevelled hair, war-torn jacket and thin-rimmed glasses give him a slightly whimsical but ordered persona. 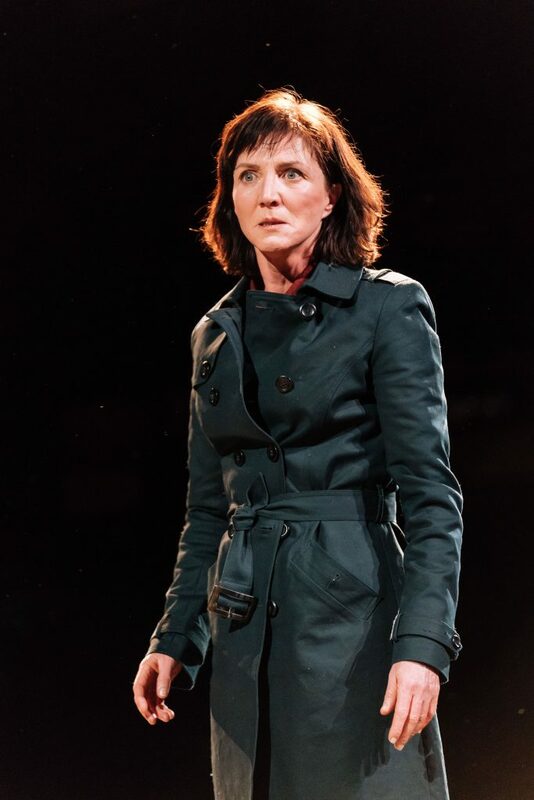 Michelle Fairley transforms Cassius into one of the most diverse and interesting characters, with great character development whilst maintaining a raw and emotional performance. The pair are responsible for the attempted coup against Julius. The plot and character development are entwined almost effortlessly with the rest of the cast woven into the story. David Calder’s gallantry commands the title role. His portrayal of the character is absolute, even in death. His ghost is reminiscent of one of the ghosts in Charles Dickens, “A Christmas Carol”. David Morrissey’s portrayal of Mark Antony is spellbinding, with his authoritative voice reverberating around the auditorium walls, you can feel the immense passion in his performance, as he regains power from Brutus, Cassius and others of the educated high society via all-out war. Bunny Christie, an award winning Scottish set designer who learned her trade at the Central School of Art in London, has conceived an ingenious set. It moves during the play and encourages the audience to duck and dive, to varying degrees during its duration. It closely resembles World War One trench warfare and involves an actual Jeep being driven through the audience. Christina Cunningham who has worked extensively in the West End designs the contemporary costumes worn by the actors. Her use of fabrics over the course of the production from the shirt and ties of the court to the post-apocalyptic battleground muddied trench coats shows a sophisticated adaption to the storyline as well as the characters emotions themselves. Bruno Poet provides a striking visual display. The diversity in his back production catalogue, such as proving concert lighting for world tours of bands like Sigur Rós, has been called on to great effect. He uses his skills to match the mood and flow of this modern Shakespeare production effortlessly. This is coupled by Nick Powell‘s intricate use of slightly jarring sound, which bolsters the powerful all-encompassing atmosphere, thanks to Hytner’s use of fliers. These act as a vector for Caesar’s propaganda drawing links to the current political situation in the West, especially the US, and movements such as Black Lives Matter, and protests against the Trump administration. The most obviously connection is to the far right and KKK and their use of fliers, flags and billboards in their messaging, which has left the American society, and to some extent Western Society, more divided than ever in recent memory. 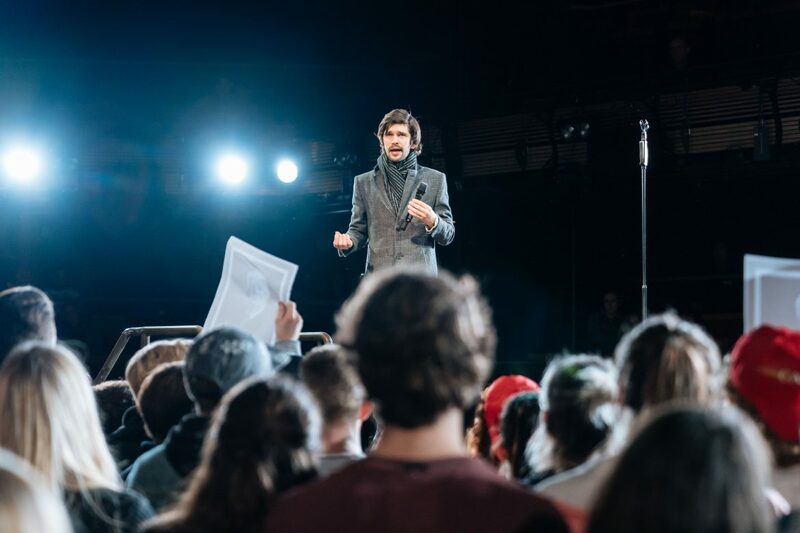 In my personal opinion Julius Caesar at the Bridge Theatre, is one of the, if not the most impressive and enjoyable plays I’ve ever been to. There is a palpable lull towards the end of the play, attributed to the audacious staging and slightly cumbersome set, as well as the absence of an intermission. But this allows you a moment to recover and reflect on the power of what you have just witnessed. Though I do think the lack of an intermission may be a fault, I also feel that the plays direction may be slightly too political in nature. It will either speak to you or leave you feeling it gets in the way of the this supreme Shakespearian play. 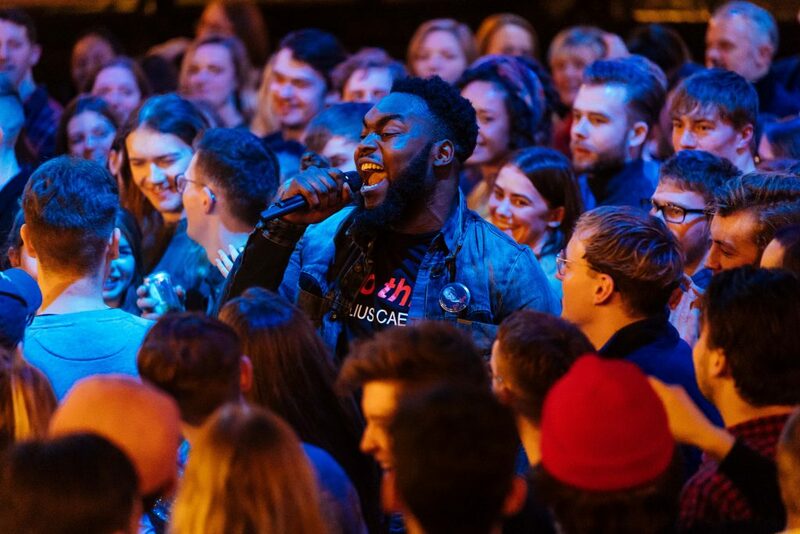 Nonetheless, The Bridge Theatre provides you with something new and a new take on drama and Shakespeare. Furthermore the stellar cast and performances will rightly lure you to purchase seats. Cameron William Michael Murphy works as a catastrophe insurance analyst in the City. 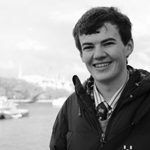 He misses his time in the field studying environmental geology and tries to get out and about London, going to numerous film screenings and theatre performances. Cameron has an eye for photography and when he can escape the city he makes sure his camera is at hand (he also has a thing for sending giffs to everyone & is partial to a mezcal margarita! ).